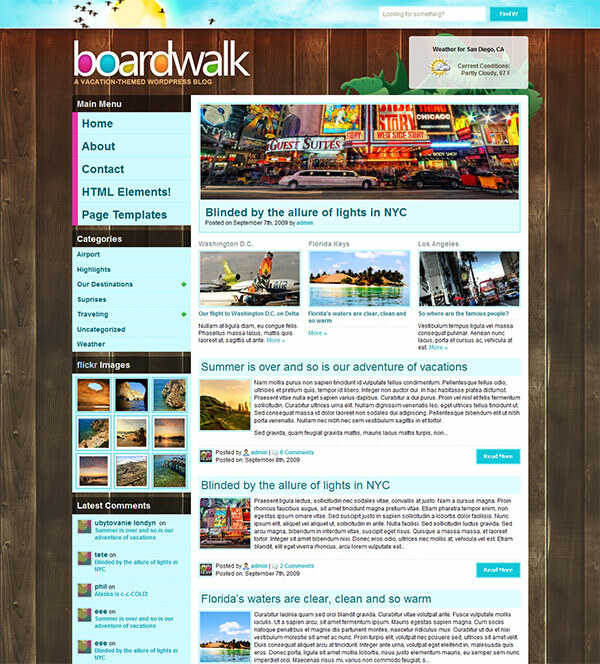 The BoardWalk premium wp theme is a travel wordpress theme – great for travel companies or a personal blog for a travel lover. It is a 2-column theme, widget-ready, and provides you with a customized weather feed. The theme is also WP 3.0 Ready, Supports 3.0’s Custom Menus, has an Intuitive Theme Options Panel, provides you with a SEO-Friendly Title Tagging & Meta Tagging Built-In, offers an Easy-to-Use Built-in Ad Locations and uses a Two-Column Layout. The theme uses JQuery Collapsable Category Menu, has a Menu & Submenu ‘Show’/’Don’t Show’ Customization, is Adsense Ready, provides you with a Customizable Weather Feed, Easy Feedburner Setup, Featured Homepage Post, 3 Featured Categories, “Related Articles” Aggregated on Post Pages, Optional “No Sidebars” Template, “Sitemap” Template, Stylish Blockquotes & Nested Blockquotes, Five-Level Threaded Comments, Custom Widgets: Flickr, Latest Comments, RSS Subscribe and Graphics including: rainbows, kites, planes, beach huts, crabs.